My grandson asked me recently to name my favorite superhero. I thought about all the traditional ones that he likes: Batman, Iron Man, Superman, and the rest of the male heroes. Then I weighed my options of Wonder Woman and Supergirl. Too boring… Instead my favorite superhero is Libba Tracy. If you have been around Black Mountain for any length of time, you know what I mean. Libba is the queen of the Save-The-World People. She has spear-headed campaigns to Save the Monarchs and after that to Save the Bees. Both of these were town-wide, multi-faceted events using art to call attention to important issues concerning the destruction of our natural world. Now Libba is turning her attention to the plight of our birds. We are losing our bird population. Many factors contribute to this loss including climate change, loss of habitat, and use of pesticides. We need to do what we can now to prevent the loss of any more birds, and Libba is determined to call our attention to this pressing need. 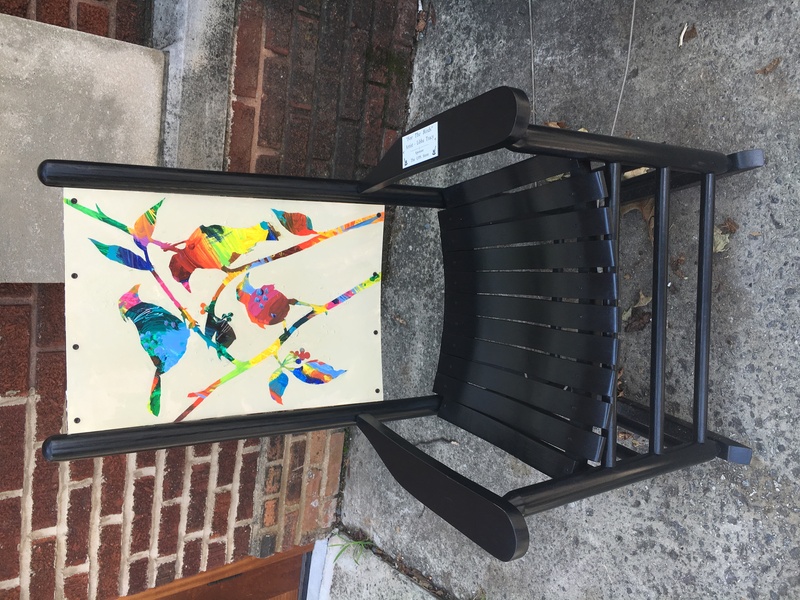 The rocking chair she designed for the Little Town that Rocks campaign is located in front of the Black Mountain Center for the Arts on State Street, and it foreshadows the major exhibit and subsequent events for September 9-October 14. Complex designs compose the birds on the chair’s back panel reflecting the complex problems associated with the survival of our local bird population. Libba is about to plaster Black Mountain with 30”X 60” “For the Birds” posters detailing the events planned for the extravaganza. Watch for them! An art show is planned for the Center for the Arts, and the Center is gathering applications from artists to participate in the show. They are looking for submissions featuring birds in our backyard. The opening reception for the art show will be held on September 9 at the Center. Tom Tribble, the Elisha Mitchell Audubon representative, will give the keynote address. In addition to the art show, 360 third graders from four schools will participate in activities at the Center, including meeting some live raptors. Also, the students will visit the two new Swift towers in the town square. They are the only ones in North Carolina and are twelve feet tall. The Swifts had been using the chimney at Louisa’s, but the restaurant replaced its roof, and the chimney was lost. These two new tall, narrow chimney-like structures will address that loss.